The Cross-Country Adventure of a Two Man Wolf Pack! The Journey of a Man & his Mutt Pup! The Original adventure began in Washington, DC on March 1st 2014. My dog Brown and I headed west on the American Discovery Trail. We walked from the Nation's Capitol to the mighty Mississippi River. On foot we found the simple luxury of time and embraced our solitude as it followed us west. We spent some time recouping in a small town in Southern Illinois. Enjoyed hot summer days kayaking on the lake and warm nights listening to the music of the hills. When I crossed the Mississippi River it was on bike with my pup in tow. Still headed west but now on the Trans American Bike Trail. Across steep grades in Missouri, through treacherous headwinds in Kansas and crossing into Colorado, where I saw mountains for the first time. We settled in Denver and saved up some money. We then left in late April 2016. 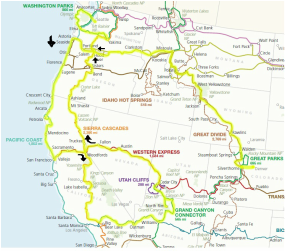 Chasing west on an epic 2,500 mile bike tour that took us through Yellowstone National Park, over eight Continental Divide Passes, following Luis and Clark's trail to the coast, and then south down the Pacific Coast Highway ending in San Francisco. There's something magical about an endless pursuit of the horizon, I give chase because of my insatiable appetite to see it all. I encourage you to follow my journey, as I may be coming to a town near you! Through this website you can follow my progress by reading my blog, twitter, following my maps, checking out my Facebook, youtube etc. Please check out my Post Office Drops, I would love words of encouragement or surprise care packages along the way. You can also support me; by clicking the link below, you'll find there are many ways for you to become a part of my journey and help out. I appreciate all the help I've received so far, much of this adventure wouldn't be possible without it!